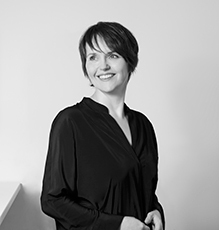 Meg is a Principal at superkül, a Toronto-based architecture practice founded in 2002 and recognized as one of Canada’s leading design firms. Superkül’s commitment to design excellence, pragmatism, and advanced building technologies has resulted in numerous architecture and design awards and the publication of the practice’s work locally, nationally and internationally. The firm has a broad portfolio of project types and sizes, ranging from single-family housing to larger scale commercial and institutional work, multi-unit housing and master planning. While diverse, all superkül projects share an attention to detail and material at both the large and the small scale, and a profound connection to their built and natural contexts. Meg is an articulate communicator and advocate for design, contributing expertise and collaborative design skills in volunteer and board positions that speak to her strong leadership role both in and beyond the design community. Since 2001, Meg has taught graduate level design at the John H. Daniels Faculty of Architecture, Landscape and Design at the University of Toronto, and been a visiting lecturer/critic at several architecture schools in Canada and the US. A past Chair of the Toronto Society of Architects, she is currently a member of the City of Toronto Design Review Panel. Meg is also a Precinct Advisory Committee member to the Friends of Fort York, and a member of the Board of Directors of the University of Toronto Schools. Meg received her professional architecture degree from the University of Waterloo (B. Arch, 1997), winning the American Institute of Architects Gold Medal in her thesis year; she holds a postgraduate degree from Harvard University (MDesS, 2003). Meg is a registered architect with the Ontario Association of Architects (OAA) and a Fellow of the Royal Architectural Institute of Canada.